As you may have read on the blog, our Journey Media classes are going to be one of the most exciting adventures yet! Watch, learn, and become inspired as Richard Garay leads you through 3 mixed media classes. Get ready to stamp outside the lines and bring your crafts to a whole new level! 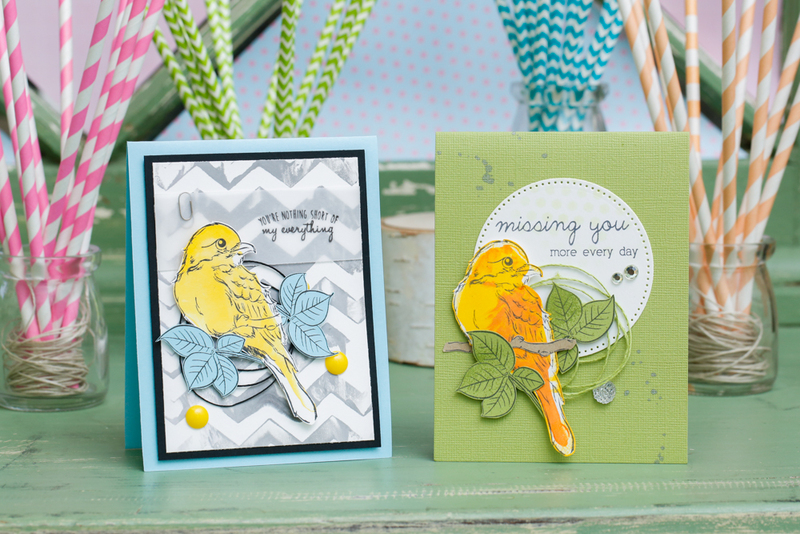 Today we have two cards that feature the Bird Sketch stamp set from the Journey Media collection. The large and detailed image is perfect for adding color in a variety of different ways! Color it in with precise detail or use more of an abstract technique. This card is created on Pool Play cardstock base. This color crush reminds me of a sunny, relaxing Saturday morning. It's cheerful, but restful, and appropriate for feminine or masculine projects. To create chevron background, squirt drops of River Stone reinker onto acrylic block. Smear Chevron Trail background stamp across inked block, and stamp onto cardstock. 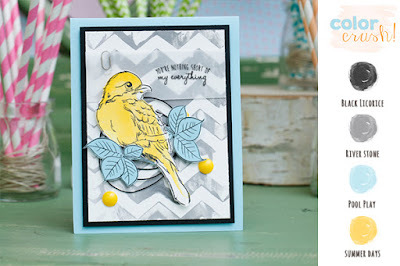 Use same technique for solid bird stamp, using Lemon Drop, Summer Days, and Banana Cream together on acrylic block. For an extra layer of dimension we stamped our sentiment on a strip of vellum and added a little paper clip. 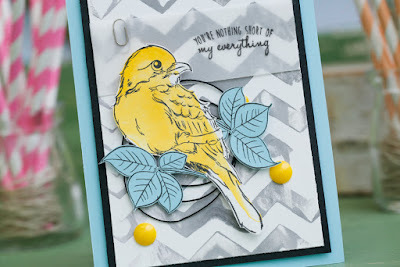 Use same technique for solid bird stamp, using Lemon Drop, Summer Days, and Banana Cream together on your acrylic block. The Journey Twine and coordinating Candy Dots are the perfect accent! 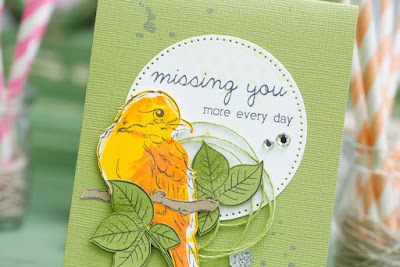 The next card is created on Lemon Grass cardstock base and we splattered some silver silk for a bit more pizzazz. We’ve add some texture to the Whip Cream pierced Journey circle by stamping with Lemon Grass Ink. The really cool part about the bird sketch stamp set is that it come with a coordinating solid bird to add really interesting detail. We’ve combine Summer Days and Orange Creamsicle re-inker to get this feathered look. 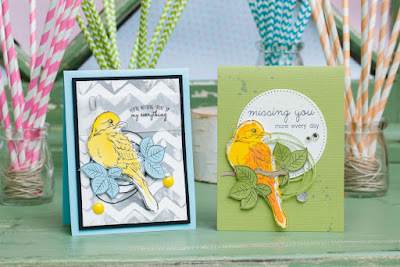 Journey Sparkle Dots, Cut Rhinestones, and coordinating Lemon Grass Journey Thread really takes the card to the next level.